Besides the Sanger Sequencing and the Oligo production service, we provide with our Next Generation Sequencing a third lab-intensive service. Over time, the NGS team has built expertise on 3 high-throughput sequencing platforms: Illumina’s MiSeq, Roche’s 454 and Thermo Fisher’s Ion Proton. With these instruments our NGS team is able to offer a wide range of sequencing applications like whole genome sequencing (WGS), transcriptome sequencing, whole exome sequencing (WES), RNA expression profiling, metagenomics and many more. So for every customer’s need they plan, adjust and perform a customized NGS application and analyse the results on request. To begin with, I am happy to introduce you to our NGS manager Silke. Silke is one of the most experienced inqaba biotec employees. She originally comes from Germany, where she studied Biology at the University of Bielefeld. For her collaborative Masters project with the South African Institute for Medical Research (SAIMR), Silke came to South Africa. She took up a position at the SAIMR and did her PhD in Human Genetics at WITS University, where she worked in an academic setting for over a decade. Silke is a registered member of the Health Professionals Council of South Africa (HPCSA). She joined inqaba biotec as NGS manager two years ago and her tasks include oversight of the NGS laboratory, and scientific client liaison / advisory on NGS project requests. She is responsible for experimental design, NGS workflow improvement and introduction of novel assays. Furthermore, her goal is to expand our NGS service into the medical area. Inqaba biotec is proud to now provide a Non-Invasive Prenatal Testing (NIPT) service in collaboration with Sequenom Laboratories. For further information please have a look at www.inqababiotec.co.za/NIPT. Silke likes hiking and travelling and lives with her family in Jo’burg. Another important team member is Acclaim. He grew up in Limpopo and came to Gauteng to study Biotechnology at University of Jo’burg. After receiving his National Diploma he started at inqaba biotec as an intern in the sequencing lab (of course). That was 4 years ago. 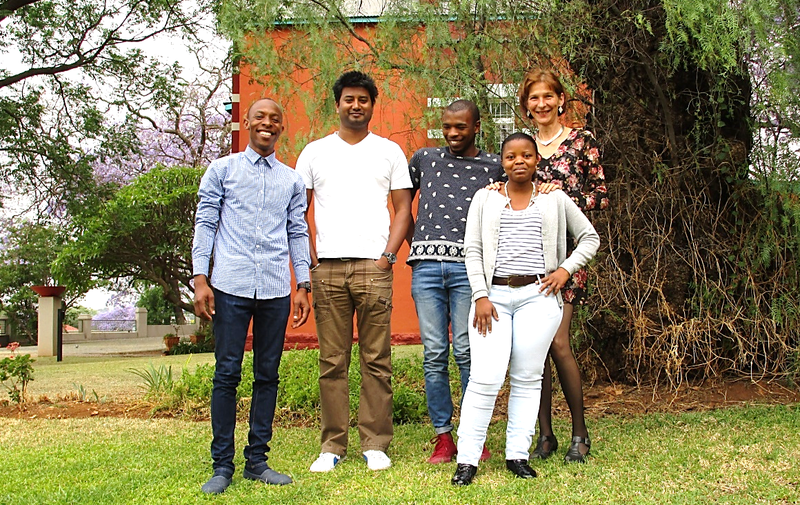 For 3 years Acclaim has now been working in the NGS team, where he operates the NGS platforms and teaches and supervises the two interns Alina and Anathi in the lab. Acclaim performs general lab organisation and troubleshooting and runs the NGS instruments. Besides his daily work, he is currently doing a Genetics and Genomics course from Stanford University and studying towards a Professional Certificate. Acclaim loves to watch football and he likes to hang out with colleagues and friends on weekends. Alina and Anathi perform together the NGS bench work. They perform the quality control with incoming samples using a NanoDrop and an Agilent Bioanalyzer and they prepare NGS libraries, using different protocols according to NGS application and customer needs. Alina is currently a student at University of Jo’burg and joined inqaba biotec 9 months ago to receive industry training for her National Diploma in Biotechnology. Later, she plans to do a BTech as well in Biotechnology. She likes the lab work and the great atmosphere in the NGS team. Anathi comes from the Eastern Cape and studied Biochemistry and Microbiology at the University of Cape Town, where he also did his Honours Degree in Human Genetics. Anathi joined inqaba biotec 7 months ago, and in his leisure time he loves reading novels and fiction. Last but not least, the longest NGS team member is Hamilton. He has been at inqaba biotec for 8 years. Hamilton grew up in Durban, where he did his undergrad studies in medical sciences. Then, he did his MSc in Bioinformatics at Rhodes University. Afterwards he joined the NGS team of inqaba biotec as Bioinformatics consultant and studied towards his PhD in Bioinformatics at the University of Pretoria. Afterwards, he stayed in the NGS team as Bioinformatics Manager, which he is still today. He takes over any NGS projects for the data analysis. He is also in charge of the CLC bio / ingenuity portfolio, does CLC training and support and develops customized hardware solutions. Furthermore Hamilton writes the inqaba biotec newsletter. Hamilton is married and lives in Pretoria, he likes swimming, running and reading. I am Asisipho Nkohla, I did my BSc. degree in Microbiology and Biochemistry at the University of Fort Hare from 2010-2012. I continued to do my Honours in Applied Microbiology in 2013 and did my Masters in 2014 and I am yet to graduate for it in the current year. I am currently doing my internship for National Research Foundation (NRF) placed at CPUT at the Biocatalysis and Technical Biology Research Group, I started on May 2016 tO finish on April 2017. I would like to join your company if any job opportunities become available currently or anytime soon. Thank you.